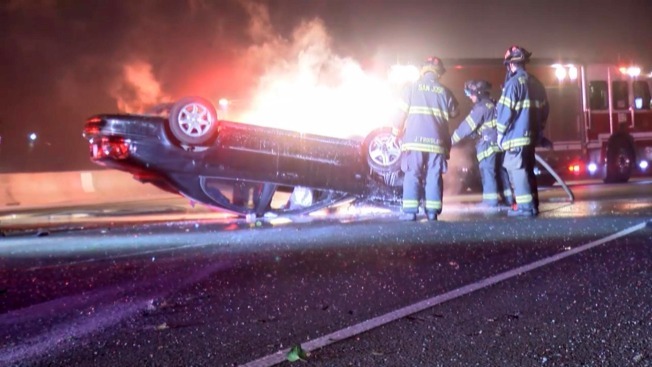 Two men are being hailed as heroes Sunday morning after rescuing a man, who was later arrested on suspicion of driving under the influence, from a burning car in San Jose. The driver of a black sedan smashed into the center divider along northbound U.S. Highway 101 between McKee and Oakland Roads shortly after 1 a.m., Sgt. Daniel Hill with the California Highway Patrol San Jose Division said. The vehicle immediately flipped onto its hood and engulfed in flames. A witness and an off-duty police officer rushed to the driver's aid, shattered one of the car's windows and managed to pull the victim from the wreckage. "Unfortunately, the seat belt was locked," the witness said. "For some reason it got locked and we couldn't get it off with our hands so an off-duty deputy came by and he had a knife. We cut the seat belt off and luckily (the victim) was saved." The witness said he didn't really think twice about stepping in to help. "It was a little bit risky, but sometimes it's worth it to take the risk to try and help someone that is needing help," he said. "There's something in your heart that makes you run and help others." The driver was not injured in the crash, but we was detained by police on suspicion of driving under the influence.